Content Marketing World has gone to the dogs! 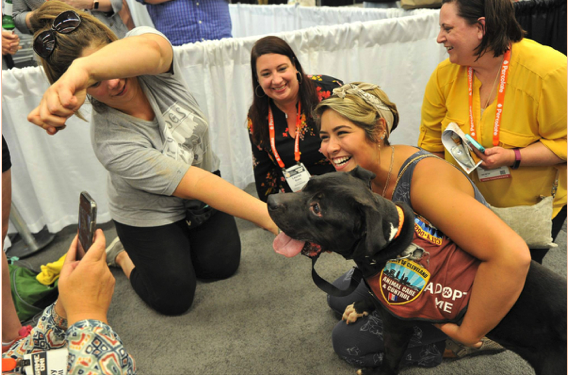 Earlier this month, CMI opened the CMWorld show floor for its first-ever Yappy Hour. After a day filled with sessions and keynotes, Yappy Hour provided cocktails for attendees and special treats for our four-legged visitors. And do you know what happens when you fill a room with animal lovers? They bark up nearly $1,300 for charity. So how did Yappy Hour work? 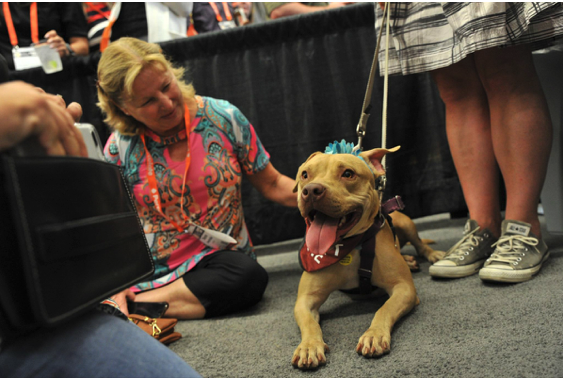 For a $5 donation to the Orange Effect Foundation (OEF), attendees were given five minutes of belly rubs and sloppy kisses with Bukowski, Corn Pops, Dixon, and Penny. And trust me, they were sloppy. Pitties give wet kisses! If that wasn’t enough, Lisa Dougherty, Senior Manager of Blog Community and Operations at CMI, took cues from Walt Disney World and “fastpassed” anyone willing to donate $20. Those attendees were immediately taken to the front of the line. One gentleman donated $100 to the cause! Our attendees truly have a generous spirit. An added bonus: Our team sent $250 to City Dogs Cleveland. Both donations were generously matched by UBM, our parent company. Not only is our CMWorld community generous, they are patient too. Attendees began lining up 15 minutes before the start of Yappy Hour. And to our surprise, some waited for as long as 90 minutes to meet the dogs. Paws down, this has been our most popular CMWorld fundraiser. Our team would also like to give a shout out to Marcus Thomas, a 2018 Content Marketing Awards Agency of the Year finalist. We couldn’t have hosted Yappy Hour without the help of King Hill, Mark Bachmann, and the rest of their team. Special thanks to them for sponsoring the cocktail reception and helping us raise money for two great causes. Couldn’t make Yappy Hour but would like to help us make a bigger impact? 💥Click here to donate to OEF. We cannot wait to introduce you to more of our furry friends at next year’s Yappy Hour! Looking to connect with other marketers before Content Marketing World 2019? Join us for our weekly #CMWorld Twitter chats, every Tuesday at noon Eastern!